A major part of eating healthy and on a budget, means eating the same staples - often. Luckily both Chad and I are not very picky people, in fact we actually enjoy eating the same things every week. It makes planning and prepping super easy, plus you find little ways here and there to change up the recipes/flavors. One of our weekly staples is ground turkey. We usually buy roughly 5 pounds every Saturday from Sam's Club and eat all of it by the following Friday. You might be cringing at the thought but believe me, it's a lot tastier on the fourth day than chicken! We started making 25 turkey burgers every Sunday but figured that was a bit limiting, although "burgers" can quickly transform into "meatballs" if you really need them to. Recently, we decided to break up our 'prep' days into the first half of the week and the second, and make whatever we wanted. 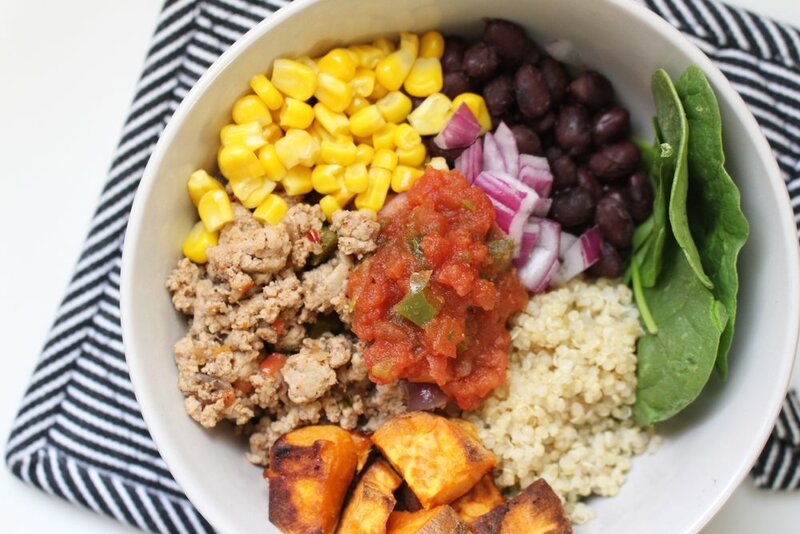 This week, we started with ground turkey quinoa bowls! By far one of my favorites. I wanted to share this super simple, healthy, and affordable recipe with you all so you could get a glimpse on what we eat throughout the week. You can sub out the turkey for ground beef if you would like, I just prefer a leaner meat when we have to eat it all week. Also, any and all toppings are completely optional. A few of my other favs that I didn't show include guacamole, avocados, fresh tomatoes, sautéed peppers or even a few tortilla chips! In a large skillet, sauté 1/2 of the diced red onion until the edges begin to brown and caramelize. Add in your ground turkey and begin to break up into large pieces. Season with salt, pepper, chili powder, garlic powder, and onion powder. Once cooked through, add in 1/2 cup of fresh tomato salsa for flavor. Next, bring two cup of water + one cup of quinoa to a bowl. Let simmer for 15-20 minutes, until "fluffy" and most of the water has been soaked up. Now that you have your super simple and delicious base, the toppings are for you to choose! I chose to go with anything and everything I had right in my pantry. I love having cans of black beans on hand, as well as frozen corn in the freezer. And don't worry, frozen doesn't mean worse. It just means frozen, and that totally okay. I am such a sucker for sweet potatoes and surprisingly, they are GREAT with a mex-inspired recipe. The sweetness is just the perfect contrast to all of the spicy-savoriness. If you want to roast sweet potatoes as such, just dice+ toss some olive oil and salt on them, and let them bake for 20-50 minutes at 400º. So black beans, corn, sweet potatoes, greens, and fresh salsa it is y'all. I hope you give this super easy and healthy week night meal a go!